Opening doors for people every day! Serving Ashburn, Virginia and the Virginia area. Thank you for using our FREE service. Enter your zip to find the best Locksmiths in our network that serve your area. Feel free to call their number direct, or click on the link and view detailed information regarding their services. Need better locks for your work? Lost or broke the key? Want to upgrade to keyless? Our business locksmiths install special high security locks in business buildings. Our business locksmith can be an in-house one or hired to do separate contracting jobs. Since locks to businesses are designed to be more secure than those usually used for homes, a business locksmith can install these locks and recommend which ones are the best for your business. Locks typically used for businesses include ones for fire exits, electric keypad locks, and locks for heavy doors. Many retail businesses also have latches that lock into automatic doors which will keep intruders from trying to open. Our business locksmith can meet your business security needs. Our business locksmith that you hire to do the job for you can provide you with any keys needed and show you how to operate keyless locks, such as card sliders and electric keypads. Most electric keypads can be set by you so that only you know the code that unlocks them. Business locksmiths can also custom make a secure lock for your business if requested. A highly secure lock cannot be picked easily and will discourage anyone from attempting to break in to your business. Keyless locks can be especially difficult to tamper with, which is why many businesses prefer to use this variety of lock. The business locksmith can install the most secure locks for you quickly and efficiently. 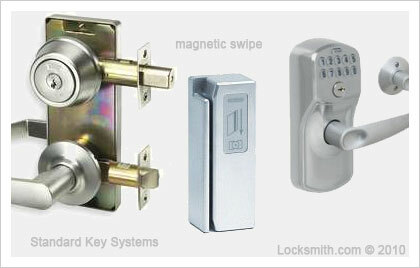 Locks for your business can be found and purchased online or provided by your business locksmith. A business locksmith can save you money and energy by installing locks for you instead of doing the job yourself. Copyright © 2019 Locksmith.com	Website Design by Digital Eel Inc.